Men and women guide cart of salted fish along rails. 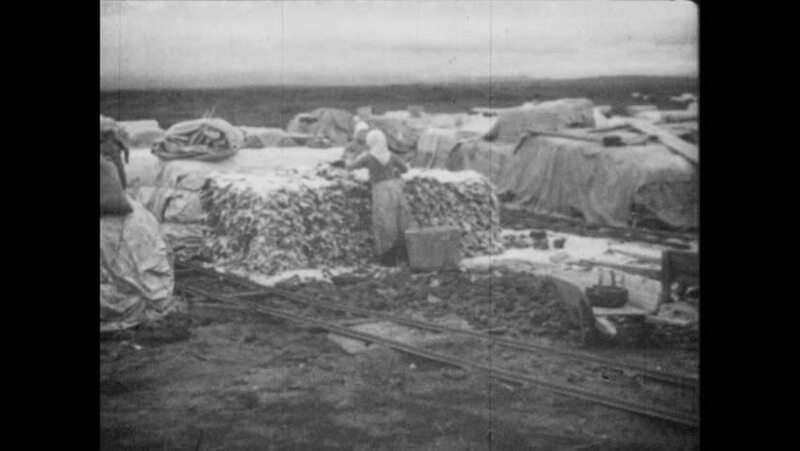 Men and women stack large piles of salted fish. Women toss plates of rock salt onto stacked fish. 4k00:151930s: CANADA: town of Parrsboro. Sailing vessels in Minas. Title. Sailing boats in harbor. hd01:38CIRCA 1910s - Bayonet practice for soldiers in training at Camp Sherman, Ohio. hd01:07CIRCA 1918\xD1Soldiers dig ditches, and servicemen travel via rails and hide in ditches along the train tracks in Northern Russia. hd00:271950s: Large industrial area by river, smoke stack, boat, forested area. House, white picket fence, couple, woman picks up baby, man touches baby, they smile, look around, suddenly look worried. hd00:11GERMANY 1940s - A rocket prepares to launch in a testing facility.